First make the set honey custard, put the gelatine leaves into a bowl and add cold water to cover and leave to soften. Place the honey in a medium-sized pan with the vanilla bean paste and simmer gently over a low heat, stirring occasionally. Heat the honey until it turns thicker and darker. Remove the pan from the heat, whisk in the cream and milk carefully until evenly combined. Place the pan back on the heat and whisk until very smooth and very hot, remove the pan from the heat. Place the egg yolks into a bowl with the salt and sugar, and whisk for a couple of minutes until very smooth and light. Whisk in the hot honey cream and when thoroughly combined, pour the mixture back into the saucepan. Return to a medium-low heat and stir constantly until the custard thickens enough to coat the back of the spoon – don’t let the mixture get too hot or come close to boiling or it will curdle. Remove the pan from the heat. Take the gelatine and squeeze out the excess water, stir the gelatine into the hot custard until thoroughly dissolved, strain the custard and put to one side to cool a little. Take an 18cm loose bottomed cake tin and line it with cling-film pour the custard into the tin and place in the freezer until completely frozen. Put the raspberry puree in a saucepan and bring to a boil. In a mixing bowl whisk together the eggs and sugar until light in colour. Add half the raspberry puree to the egg mixture and whisk until fully incorporated. Return everything to the pan and stir over a low heat for 5 minutes or until it starts to thicken. Squeeze the excess water from the gelatine and stir it into the curd until it dissolves completely. Pass the curd through a sieve into a bowl and slowly mix in the butter a piece at a time, until it melts. Take an 18cm loose bottomed cake tin and line it with cling-film pour the curd into the tin and place raspberries in the curd so they are sticking out of the curd, you might not need all of the raspberries, place the curd in the freezer until completely frozen. Preheat the oven to 190C and line a 25 x 30cm baking tray at least with greaseproof paper or a silicone mat. Put the eggs and sugar in the bowl of a stand mixer, place a small amount of water in a pan and bring to a slow boil. Place the bowl over the bain marie and whisk until it reaches 37C. Remove the bowl from the heat and using the whisk attachment, whisk until the eggs reach a ribbon stage. This means the mixture forms a trail and sits on top of the mixture before sinking in. Fold in the flour and when it is nearly all folded in, take a couple of spoonfuls of the mixture and mix it with the melted butter. Return this to the rest of the mixture and fold through until it is fully incorporated. Pour the mixture into the baking tray and spread out evenly with a stepped palette knife. Bake in the oven for 12-15 minutes until golden brown and the sponge springs back when touched gently. Soak the gelatine in bowl of cold water and leave to bloom. Place the white chocolate in a large bowl, big enough to take the milk and eggs as well. Place the egg yolks and sugar in a bowl together and whisk until pale and well combined. Pour the mixture back into the pan and warm it until it coats the back of a spoon. Squeeze the water out of the gelatine and add it to the hot custard and stir until it dissolves. Pour the custard over the white chocolate and allow it to stand for a minute or two before stirring it and melting the chocolate. Whip the cream until it forms a stiff peak and then slowly fold it into the chocolate mixture. Put the bavarois in a piping bag and use immediately to assemble your entremet. Take the genoise and cut out a circle slightly smaller than the 20cm cake ring, around 19cm diameter. Take a board or round loose-bottomed cake tin that is 23cm diameter and place a layer of cling film in the bottom and make sure there is enough space in the freezer to fit the entremet before you start. Place the 20cm cake ring in the middle of the cling-filmed board or cake tin and then place the genoise inside the cake ring. Take the frozen custard and remove it from the tin, place it flat side up, so the bottom becomes the top and push it down into the sponge. Take the set raspberry curd remove it from the tin and any cling-film and place it flat side down on top of the custard so that the raspberries that are sticking out are facing upwards. Now fill the sides and top of the mould with the white chocolate bavarois, make sure to fill all of the gaps in the mould and smooth the top with an offset spatula. Place the whole entremet in the freezer and leave for at least 4 hours to set completely. To make the mirror glaze bloom the gelatine in cold water and place the white chocolate in a separate bowl that is big enough to take all the ingredients. Remove from heat, squeeze the excess water from the gelatine and add it to the pan, then pour in th condensed milk. Pour this mixture over the white chocolate and allow it to sit for a couple of minutes. Mix well with a spatula until smooth then add the oil and food colouring and mix the glaze thoroughly until evenly combined. To make the neutral glaze heat the water with the sugar, dextrose and glucose until it reaches 40°C/104°F. Mix the pectin and remaining sugar together and add to the liquid. Bring the mixture to a boil, add the citric acid and the titanium dioxide and boil for 3-4 minutes. Allow to cool and keep in the fridge for up to one week. 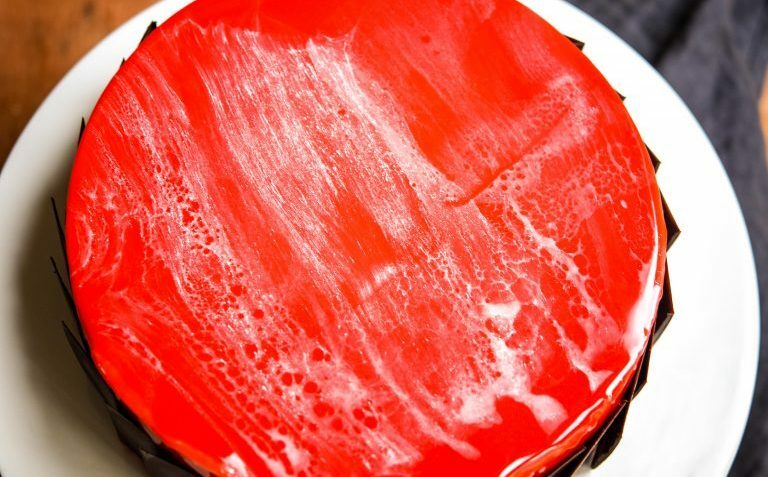 Allow the red glaze to cool to 35-40C before using, place the entremet on a cake rack over a baking tray that can collect the glaze which drips off. You may find you want to stand the entremet on a smaller cake ring or a can that elevates it further to make it easier to move. Place the glaze in a jug so you are ready to use it, you need both glazes ready at the same time. Bring the neutral glaze to a simmer and keep it in a saucepan. Heat a metal spatula using boiling water, immediately cover the entremet with the mirror glaze and pour it over the whole dessert starting from the middle. Pour a little amount of hot neutral glaze over the spatula and lightly spread it over the mirror glaze. You have to do it very quickly, right after glazing. The result will depend on the neutral glaze, temperature, force on the spatula, and the amount of glaze and so on. Every time you will get a new pattern! Take the finished entremet and place it on a plate or cake card and decorate with tempered chocolate squares round the edges or a decoration of your choice. Place the cake in the fridge to finish setting and allow the layers to thaw.